Forget El Nino storm-like weather that has been hitting the state of California this entire winter unloading much needed rain for weeks. And forget the fact that cities all over California are being sprayed every single day with chemicals by mostly unmarked planes in an ongoing crime against humanity that you cannot offer any politician any amount of money, argument or reason to address. The 50th annual NFL Super Bowl is here and even though it's being played in Northern California which has seen its fair share of rain thanks to “El Nino” all winter, we can all relax and enjoy the coincidental perfect weather that we will see on Sunday February 7, 2016 for the Super Bowl. Coincidence theorist football fans all around the country can smile this weekend and know that nature somehow seems to know when to stop the rain and wet weather when important events come into town. On this Super Bowl Sunday it's a perfect time to be one of those coincidence theorists that attributes the sudden change in weather to good luck and spontaneous coincidence. Such is the world we now live in where the general public is dumbed down to mind-boggling levels of ignorance and stupidity while the masses drink whatever Kool-Aid the government, its military and its mouthpiece media will offer them to remain blissfully happy. To make matters worse, the Pentagon and the U.S. Air Force who are the primary enemies and perpetrators behind the criminal spraying of the sky will play their psyop commercials and hypnotically steal the minds of our children and like little hypnotized slaves, convince them to join the military during commercial breaks and paid-for game ceremonies. Some may be reading this thinking, who can predict the weather? Yes, the weather is unpredictable isn't it? Or at least it's supposed to be, right? When it's not being manipulated for numerous agendas that is. The fact of the matter is that while all of this is happening, back in reality, the U.S. Department of Defense, the U.S. Air Force and all their corporate co-conspirators are leading the way systematically spraying the skies above we-the-people how and when they wish to do so, all according to their agenda. Their hundreds of patents to profit from the spraying continues to be widely available to anyone willing to research this issue. An issue that is sadly completely non-existent to the idiot football fans who are ready to join the U.S. military and who live in blissful ignorance about everything going on. Nevertheless, the U.S. military sky terrorists march right along with their deceit, their lies and the global agenda for “owning the weather in 2025” as is clearly outlined in the U.S. Air Force paper drafted in 1996. And it is easy to envision the power of owning the weather being used to “clear” things up for the big game, even in the middle of a rainstorm season. The thing about the acquisition of knowledge is that it's continuous. I've always called for everyone to keep things simple. Don't think for a minute that the U.S. military will ever get hundreds of patents for things they don't plan to profit from. They are also not about to reveal anything to the general public or admit to anything that would jeopardize their agenda. And if and when they are caught or exposed they'll just lie and propagandize their way out of the issue. Unfortunately this is the world we live in. And this Super Bowl weekend is the perfect time to blissfully forget anything that is happening in the sky, shut up and accept whatever your government and their mainstream media tells you to believe. Want to believe that the weather is not being controlled by the those who have openly stated control of the weather was their goal over twenty years ago? Then don't believe it. 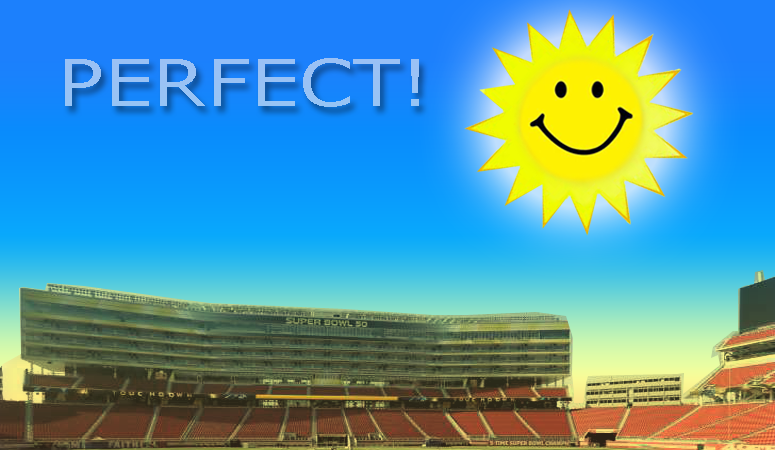 Tell yourself this suddenly perfect Super Bowl weather is simply a coincidence and good luck and enjoy the game. Forget those lines spray painted in the sky ruining one beautiful blue sky day after another. Ignorance truly is bliss and no other topic brings out the blissful ignorance than geoengineering and chemtrails spraying ongoing real-time crimes that everyone has a chance to actually (and uncomfortably) watch with their own eyes. The best part about choosing blissful ignorance with respect to the daily geoengineering crimes committed by the U.S. Air Force as it relates to the Super Bowl is that this topic is very easy to avoid and you can be sure it will never interfere with your enjoyment of the game. In fact, come game time, I wouldn't be surprised to see a chemtrails plane or two fly above the stadium to spray everyone with their chemical poisons as the crowd cheers for the U.S. Air Force and military. This is indeed the new level of ignorance we're all dealing with where the crime is not enough, instead, Intelligence likes to one-up the general public and get them to applaud their own enslavement like they did in Watertown, Massachusetts during the declaration of martial law following the Boston bombing false flag event. We saw the same scene after 9/11 as the crowd of workers cheered for Bush Jr as he spoke to them with his bullhorn. Little did the crowd realize they were staring at the president of the regime who planned 9/11 from beginning to end. 9/11 also got attention a year ago when Seattle Seahawks head coach Pete Carroll spoke 9/11 Truth to the media. So if we can learn anything from the past it's that all it takes is for one person to stand for truth to create a ripple effect. Will someone stand for truth this year? As we all wait for someone to step up, remember that this event is heavily paid for by the Luciferian elite and all the players who are vying for power and riches in this life. This event is not about humanity, the poor, the needy or even the homeless as we saw earlier where the homeless were evacuated from nearby San Francisco streets. This event comes with a lot of rituals, subliminal messages and mass mind control to glorify the state, sell propaganda and control the masses. A massive event like the Super Bowl is always an event to watch especially in a year (2016) that could officially mark the end of America. If nothing else it is a golden opportunity to role out the militarized new world order police and further condition the masses to accept their enslavement and accept the police state. And as the Air Force brags about how they are going to “defend” the airspace above the Super Bowl, remember that it's also a perfect situation for a false flag attack on the clueless masses. Let's not forget the U.S. Air Force was “defending” the sky on 9/11 also. Sadly lost in all of this is the fact that the only reason this event is happening is because two football teams will play a GAME and nothing more. It's simply a game between two teams to see who wins. In this crazy Orwellian world we live in it's easy to forget what the event was all about to begin with, isn't it?